I presumed everybody knew about Kiva. I was wrong. I met a few marketing guys recently that had not. So I want to mention it - as it must be one of the most interesting, powerful and truly amazing uses of the internet I have come across. Kiva is a micro-finance company that allows ordinary folk like me give small loans to help budding entrepreneurs get out of poverty. Meet Lilly Toa. She is 41, has 7 kids and sells coconuts in Taufusi, Samoa. 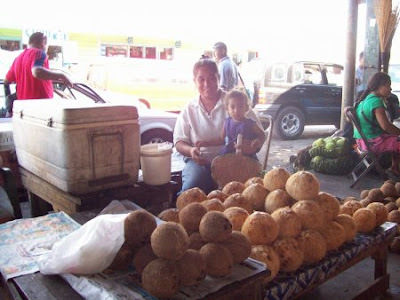 Like many entrepreneurs, Lilly needed cash to grow her business - harvesting and selling coconuts in the marketplace. She didn't need much cash though. Just $850 in total. My contribution? Just $25. What makes Kiva wonderful is how close it brings the person giving the loan with the individuals receiving it. I didn't give Kiva a loan. I chose Lilly from a list of individuals to loan my $25. Evidently I chose well. She paid back in full and her business is thriving. How do I know this? Because Kiva sends me regular updates from Lilly. I suspect I could write all day about how good this model is. And how charities, banks and other companies could learn from this. Instead, I suggest you pop over to Kiva, whip out your credit card and give somebody less fortunate a small loan. Then sit back and wait to be overwhelmed. Impact. Its all about impact Paul.